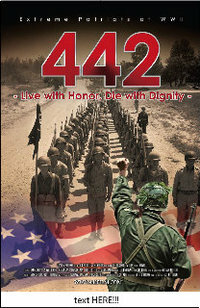 Aug. 21-22 — “442: Live with Honor, Die with Dignity” and “Toyo’s Camera” will be shown as a double feature at the Museum of Photographic Arts at 11 a.m. (“Toyo”), 1:10 p.m. (“442”), 3:20 p.m. (“Toyo”) and “442”) 5:30 p.m. Tickets: $13 at box office, $10 in advance. Both films were written and directed by Junichi Suzuki. Suzuki graduated from Tokyo University in 1975, and graduated from New York University Graduate School Film Program in 1995. Suzuki resides in the States since 2001 along with his wife, an actress, Rumi Sakakibara. Following the director’s previous film “Toyo’s Camera,” which traced the experiences of photographer Toyo Miyatake during World War II, “442” uses archival footage and interviews with regiment members to reveal the 442nd’s little-known history. The Museum of Photographic Arts is at 1649 El Prado, San Diego, CA 92101. For information, call (619) 238-7559 or visit mopa.org. Tickets may also be purchased by phone at All American Tickets at (888) 507-3287 or at Asahiya, Book-Off, Kinokuniya, Sanseido and Book Value of America.